Please refer to our stock # B-21 when inquiring. 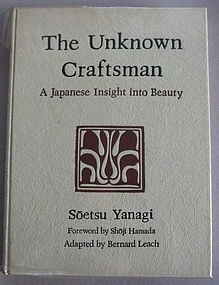 "The Unknown Craftsman: A Japanese Insight into Beauty" by Soetsu Yanagi, Foreward by Shoji Hamada, adapted by Bernard Leach. 1973 second printing, Kodansha. Hand-laid paper bound hard cover wit original plastic dust jacket. Book condition - New, small tear (4 cm) on plastic cover. 12 Color and 64 B/W plates. The "bible" of Folk Craft Theory (Mingei Biron) in English. "This book challenges the conventional ideas of art and beauty. What is the value of things made by an anonymous craftsman working in a set tradition and producing the same objects continuously for a lifetime? What is the value of handiwork? Why should even a roughly lacquered Japanese farmer's rice bowl be beautiful? The late Soetsu Yanagi was the first to fully explore the traditional Japanese appreciation for "objects born, not made." The author's profound view of the creative process and his plea for a new artistic freedom within tradition are especially timely now - perhaps even overdue."